Today I offer you a page from a vintage sewing book, "Dressmaking Made Easy", 1941, McCall Corporation....because it has been difficult for me to sew anything more complicated than children's garments recently because of particular medications I need to take. 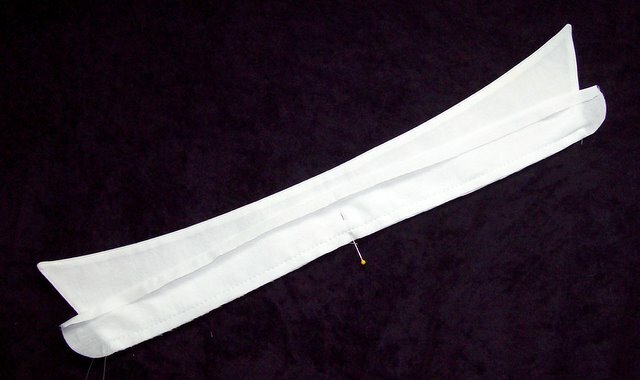 This is the way I was trained to sew a sleeve placket (also known as a "gauntlet") by my mentor, an "old world" Tailor with exacting standards of excellence. 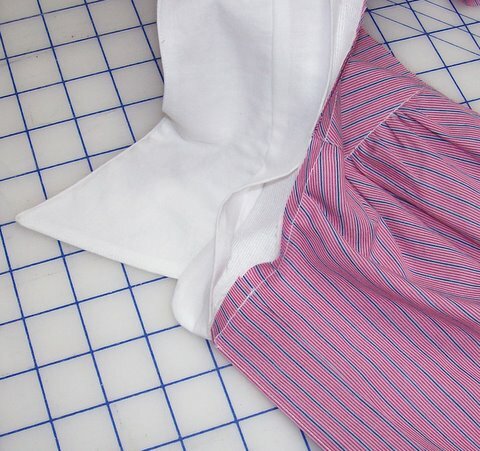 I still use this method almost every time...a placket with 2 separate pieces, the overlap and underlap. By using 2 pieces, I find I have more control to fold and press most accurately. 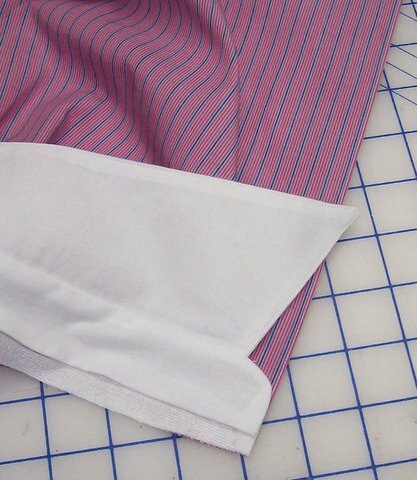 Additionally a 2-piece placket offers more design opportunities, such as using different fabrics for the over and underlap....even changing the top (peak) of the overlap...perhaps making it square, curved (rounded), and more. 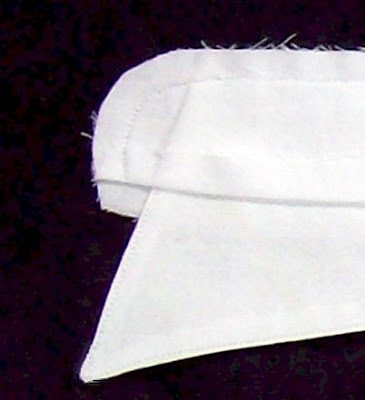 By offering this method, I am not implying it is the only way to sew a sleeve placket. 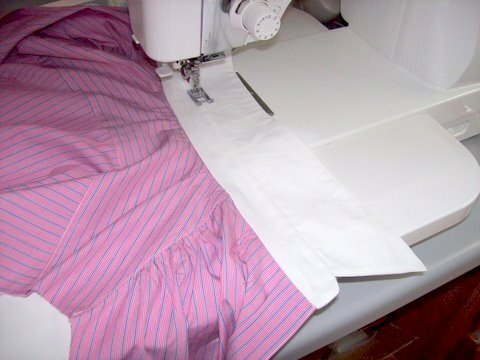 I know at least 4 other ways to accomplish this task...but this is the method that produces the best results for me with most fabrics. The measurements I choose to use most often: Underlap-- about 1.75 inches wide x 6.25 inches. Overlap-- about 2.50 inches wide x 8" to the top of the "peak". 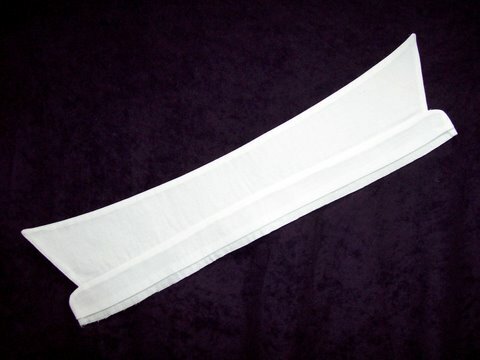 Measurements include 1/4 inch seam allowances and 1/4 inch "edge-folds". Make a sample to see if you like these measurements...if not...feel free to change the height and width. 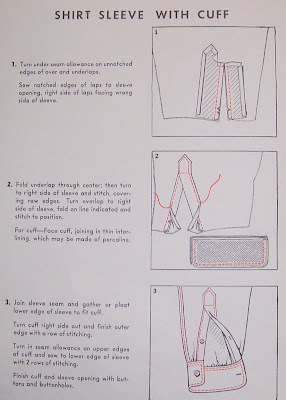 IMPORTANT-- When you enlarge this diagram to see detail (by clicking on it), please take notice on the first step, that ALL edge-folds are pressed BEFORE the laps are stitched to the sleeve slit. Professional Sewing Supplies are now available from the finest Fashion Workroom Suppliers at Fashion Sewing Supply ...Featuring Many Kinds of Premium Quality INTERFACING, PRO-STRETCH ELASTIC , The Collar Turning Tool, Professional seam Measuring Gauge, and More new products coming soon! Please visit Fashion Sewing Supply for more information. NOT ON OUR MAILING LIST YET ? Join the 1500+ sewing enthusiasts who are and Never Miss a SALE or New Product Announcement! 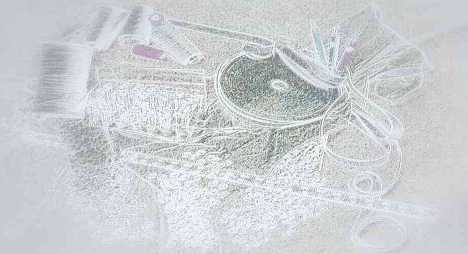 Click here to EMAIL~Fashion Sewing Supply~ and send us your contact information. We must purchase large quantities of the professional sewing supplies that we use at the ~Off The Cuff~ design studio including some that we have milled to our own specifications. Now we offer these same sewing supplies to you directly from our own stockroom in amounts that are appropriate for your individual home sewing needs. 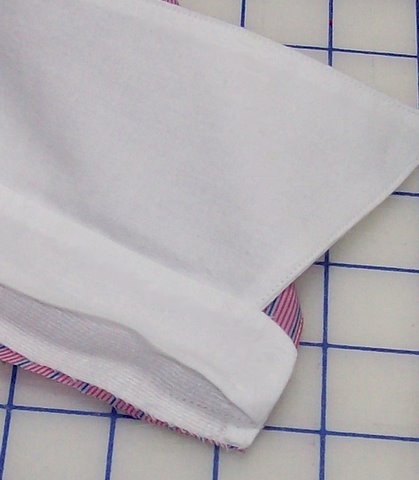 How to Sew a Classic SHIRT COLLAR- 2) Attaching the collar-unit to the neck-edge. Continuing with the construction of the shirt...it's time to attach the "Collar Unit" to the neck-edge. After gathering the fronts to fit the back shoulder (yoke)...the front, back, and yoke are completed and ready for the collar. Match the center-back of the raw edge of the collar stand to the center-back of the garment's neck edge. Pin to hold. Next, Match the center-front edges of the stand and blouse EXACTLY. Now, begin to stitch them together. Start at the edge and continue to stitch towards the center back, only for about ONE INCH. Then check to make sure the CF edges are still exactly even. 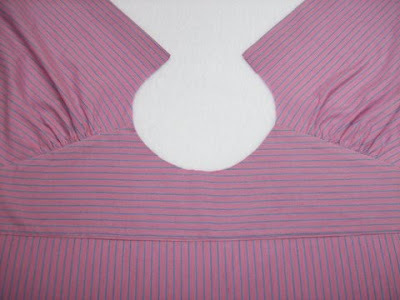 It's much easier to remove one inch of stitching and re-align the edges now, rather than discover they are not even after the entire collar-band is stitched to the neckline! Repeat on the other CF edge, then stitch the entire stand to the neckline. Then tuck the seam allowances up and under the folded edge of the collar stand. Continue to tuck the seam allowances under the folded edge of the collar stand, just barely covering the stitching line. You may find that using a glue-stick is helpful to hold the folded edge in position. 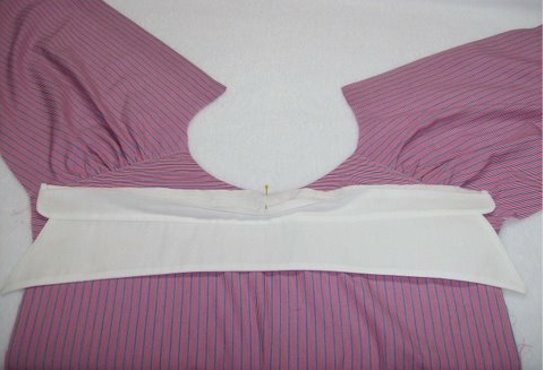 Next at the machine, with the outside (right side) of the shirt facing up, begin to edge-stitch the band (collar stand) starting at center back as shown. Then continue to edge-stitch completely around the entire stand, ending where you began. Now admire how nice your finished collar looks..inside and out! 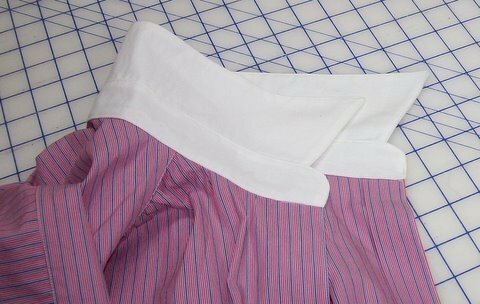 How to Sew a Classic SHIRT COLLAR 1) Assembling the Collar Unit. I usually sew the stand to the collar before attaching the complete "collar unit" to the neck-edge of the blouse. Please note that all collar seam allowances, the stand seam allowances, and the neck-edge seam allowances have been trimmed to 1/4" for ease of construction. 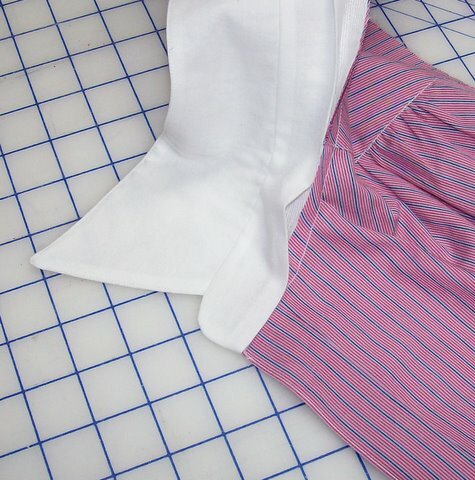 Apply interfacing to just one of the long collar stands. Next, I took an extra step and quickly basted this piece to the "UP-side / TOP side/ Right side / Public side" of the collar. This stand piece will be the "inner band" when the shirt is complete. Then, I made a "collar sandwich"....with both the interfaced stand and the stand without interfacing matched right-sides-together, and the collar between them. I stitched them together along my previous line of stitching...using very small stitches when sewing the curved edges. ready to be turned and pressed. After turning and pressing, here is the finished "Collar Unit"....ready to be sewn to the neck-edge of the blouse!